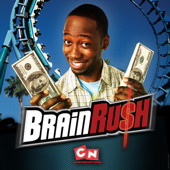 BrainRush (also spelled BrainRu$h) was a live-action game show that premiered on Cartoon Network on June 20th, 2009, as part of the CN Real block. The series took place at the Knott's Berry Farm theme park in California where 3 contestants would ride a roller coaster and answer trivia questions to win money. The contestant with the least amount of money would drop out before the next round. The first, second, and third rounds took place on the Boomerang, Silver Bullet, and Xcelerator. The final contestant had the chance to win $5,000 in prize money. BrainRush and other CN Real shows received poor reception for airing on a channel known for primarily airing cartoons. The show was also criticized for its poor quality, leading it to be canceled on July 22, 2009. According to a comment made by The Othersiders Archive, the full series was available on YouTube but was later taken down. In late January of 2018, Lost Media Wiki user Comikid found episode 5 and was able to extract the episode from iTunes and has since been uploaded to YouTube (with the help from another user Dinkleberg). On February 1, 2018, another Lost Media Wiki user named Johnny 2x4 found a minute and a half clip of the show. A remix containing clips from the show that was originally posted on CNThisSummer's YouTube account.